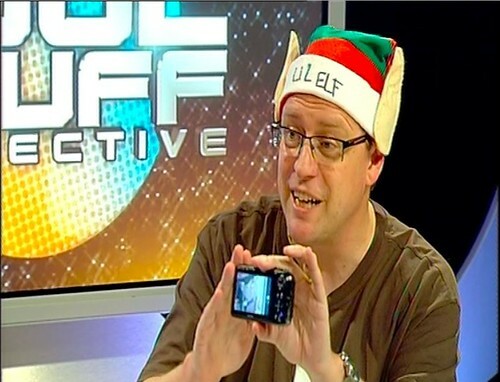 The final episode (13) of The Cool Stuff Collective series 1 is airing this week and its the christmas special. I was lucky enough to be able to give a variety of 3d pieces of tech an outing. A fuji 3d camera, the vuzix eyewear and a Toshiba/Nvidia 3d laptop. Cover 3d on 2d TV is like doing colour on a black and white screen but I think we did it justice. A screen for each eye with vuzix, showing 2 lenses and a lenticular lens viewer on the camera and side by side images for the laptop. The lenticular lens rippled nicely on screen and the side by side picture illustrated the principle whilst Sy got to see the actual real effects. We did not fake any of it either as it seems important to do these things for real. The madness of christmas meant we did a 12 presents of christmas line up passing the presents along the line whilst Father Cool did his vicar style duties followed by a christmas rap. Hence the various stances we took. It was a manic take and we just got told to go for it, the more disorganised the better. Which is what we did. We had to be really careful with some of the toys to not press any of the noisy buttons as we passed them along the line. This was a great finale I thought and probably the most I have laughed at work ever, and thats saying something. In the recording I talked about the aspirations of the 2022 Japan World Cup bid, which of course now we know has gone to Qatar, however the technology future still stands up. Fingers crossed still for series two. I think I like doing TV you know!